AN MEP has urged the European Parliament to dismiss 'dogmatic politics' in favour of science when formulating policy for genetically modified (GM) technology. George Lyon, Liberal Democrat MEP for Scotland, spoke in the European Parliament this week in response to the European Commission's proposal to allow Member States to unilaterally ban, restrict or permit commercial cultivation of GM crops. Mr Lyon, who is drafting the European Parliament's response to the Commission, warned the Commission proposal could allow politics to run the debate. "Decisions on new technologies such as GMs should only be based on scientific advice. "The danger with this proposal is that it would allow Member States to ban cultivation for political reasons. "Without the bedrock of scientific advice to anchor decisions, you risk setting a dangerous precedent in choosing what is popular over what is safe. "Consumers have genuine fears which need to be addressed by politicians, not exploited for political gain. "I have serious reservations about the Commission's approach to this issue and the agriculture committee will have to come to a decision to either reject the proposal or improve it through amendments," he said. Transgenic Plants - Corporate or College? Ten years ago, genetically modified organisms (GMOs) emerged in the public forum as one of the major controversies in the plant breeding world. Transgenic plants - containing DNA from other organisms - are at the center of the controversy. Cornell's campus is a powerhouse of plant research, where transgenic plants are created. The College of Agriculture and Life Sciences contains the departments of plant biology, plant breeding & genetics, and horticulture, with labs and greenhouses in Ithaca and at the New York State Agricultural Experiment Station in Geneva, NY. The Boyce Thompson Institute (BTI), an independent non-for-profit organization for plant research with a world-renowned reputation, is near the Vet School. Scientists have been developing transgenic plants at the university since the Green Revolution of the 1960s. One famous example is the GMO papaya, developed by Prof. Dennis Gonsalves, plant pathology. Gonsalves collaborated with scientists at the University of Hawaii and the USDA for nearly two decades to introduce a resistance gene into papaya - the genes combated a virus that destroyed Hawaiian papaya crops. The project succeeded, and the collaboration also marked the first time a university-pursued and approved deregulation - extensive testing and then approval by the US Department of Agriculture (USDA) for commercial use - of a transgenic fruit in 1996. The landscape has changed for academic research on transgenic plants. Today, very little research on Cornell's campus develops transgenic plants for commercial use. Prof. Jim Giovannoni, plant biology, a USDA plant molecular biologist who works at BTI, studies the ripening pathways in tomatoes and fruit. Though he works with these edible crops, "Most of the transgenic plants we make are to address questions of basic biology. In general, they're not designed to create a product," said Giovannoni. Researchers in Giovannoni's group create mutant tomatoes using Agrobacterium tumifaciens - a pathogenic plant bacterium that can inject DNA into plant cells - to introduce a transgenic DNA sequence made up of viral (cauliflower virus), microbial (Agrobacterium and antibiotic resistance markers), and mostly tomato DNA. They do this to manipulate the expression of specific genes. Growth of transgenic plants in greenhouses at Cornell and BTI is tightly regulated to prevent the escape of pollen or plant materials. Screens cover block the entry of potential pollinators, and all plant material grown in a greenhouse with the transgenic plants, whether transgenic themselves or not, must be "rendered biologically inactive" by pressure-cooking in an autoclave before disposal, according to the Cornell Institutional Biosafety Committee form for greenhouse use. Growing transgenic plants in field trials is even more tightly regulated, requiring a permit from the government, a minimum distance from commercially grown crops of the same plant, and swaths of land around the field to minimize the movement of transgenic material. Prof. Tom Brutnell, plant breeding and genetics, a scientist at BTI, studies corn genetics. In one of his collaborative projects funded by The Bill & Melinda Gates Foundation, his group studies photosynthesis genes from C4 plants with the long-term goal of eventually engineering them into C3 plants, like wheat and rice. C4 plants have very efficient photosynthetic mechanisms that allow them to thrive in hot, dry locations. Brutnell's group uses the model, non-crop plant Arabidopsis thaliana for much of their transgenic work. Part of the reason he uses model systems is the ease compared to using transgenic crop plants. Brutnell said, "Many of the regulations on transgenic plants hamper their use in basic research." Once developed for commercial use, plants must be deregulated by the USDA and the Animal and Plant Health Inspection Service (APHIS). This is an expensive process, requiring extensive testing and data collection. Prof. Margaret Smith, plant genetics & breeding, Associate Director for Cornell Cooperative Extension, follows genetically engineered crops closely. As a corn breeder, Smith doesn't develop transgenic plants. However, as part of her extension appointment, she educates audiences on and off campus about genetic engineering in order to demystify the technology. According to Smith, "There's still quiet a bit of interest in genetically engineered crops." However, due to the high costs associated with technology use and deregulation, she added, "That interest is largely concentrated in the private sector." JAKARTA--MICOM: Potensi jamu untuk pengobatan cukup besar di Indonesia. Apalagi gaung back to nature yang melanda dunia, banyak orang kembali ke herbal dibandingkan obat kimia. Sayangnya di Indonesia, meski jamu sudah dikonsumsi dan diturunkan ke tiga generasi, produk tersebut belum bisa naik kelas. Jamu belum dianggap sebagai obat alternatif dan preventif. Seperti dikatakan oleh Dr Hardhi Pranata selaku Ketua Perhimpunan Dokter Herbal Medik Indonesia (PDHMI), saat ini jamu atau herbal akan didorong menjadi bagian dari pengobatan yang diakui oleh para dokter. "Tahun 2007 Presiden SBY menginginkan agar jamu dipakai dalam resep dokter. Tentu tidak mudah membiasakan dokter memakai jamu sebagai resep pengobatan. Tapi itu yang sedang kami lakukan menjadikan herbal sebagai pengobatan dan preventif," terang Hardhi di sela-sela konferensi internasional tentang obat herbal yang diselenggarakan Badan Pengkajian dan Penerapan Teknologi (BPPT) di Jakarta, Selasa (19/10). Lebih lanjut Hardhi mengatakan untuk menjadikan jamu sebagai resep dokter, maka bahan-bahan alami yang dibuat untuk jamu harus diketahui khasiatnya. "Memang untuk menjadikan jamu atau obat herbal lainnya sebagai fitofarmaka memakan waktu lama, dan biaya cukup mahal. Maka cara yang paling cepat dengan pendekatan ilmiah atau scientific jamu," tambahnya. Terlebih lagi potensi ekonomi cukup besar di sektor obat herbal ini. Pasar obat herbal Indonesia pada 2003 sebesar Rp2,5 triliun, dan meningkat menjadi Rp8 triliun-Rp10 triliun pada 2010. Dalam kesempatan itu, Indah Yuning Prapti dari Balai Besar Penelitian dan Pengembangan Tanaman Obat Tradisional Balitbangkes Kementerian Kesehatan yang berada di Temanggung, Jawa Tengah, menerangkan untuk menjadikan jamu sebagai resep dokter, para dokter dan apoteker akan dilatih selama 50 jam seminggu di Temanggung, untuk belajar tentang khasiat bahan-bahan alami berkhasiat untuk jamu pada November mendatang. Bahkan sudah ada 12 rumah sakit di seluruh Indonesia yang sudah menggunakan herbal sebagai pengobatan. Adapun 12 rumah sakit itu adalah RS Persahabatan Jakarta, Pusat Kanker Nasional Dharmais Jakarta, RS Sardjito Yogyakarta, RS Karyadi Semarang, RS Hasan Sadikin Bandung, RS Dr Sutomo Surabaya, RS Syaiful Anwar Malang, RSAL Mintohardjo Jakarta, RS Pirngadi Medan, RS Kandou Manado, RS Sanglah Bali, dan RS Wahidin Sudirohusodo Makassar. Selain itu, langkah lain yang ditempuh adalah pembentukan komite science jamu, yang nantinya akan mempercepat upaya jamu menjadi fitofarmaka (obat jamu lulus uji klinis). "Kalau menempuh jalur dari herbal ke fitofarmaka memang lama, maka dengan pendekatan ilmiah atau scientific ini bisa mempercepat proses fitofarmaka. Caranya tumbuhan berkhasiat yang biasa untuk bahan jamu diteliti khasiatnya untuk dijadikan bukti ilmiah. Saat ini ada 3000 item produk herbal baik berupa jamu, suplemen kesehatan, herbal terstandar atau fitofarmaka," terang Indah. Hanya saja, dari sekian banyak item itu yang masuk dalam kategori fitofarmaka baru empat yakni obat fitofarmaka untuk antikokestrol, asam urat, antihipertensi, dan antihiperglikemi. Untuk menuju fitofarmaka ini, para industri herbal juga harus memperhatikan kualitas bahan tanaman sehingga tidak mengurangi kualitas. Para petani yang menanam tanaman herbal pun wajib diberi pelatihan, untuk menjaga kualitas dan khasiat. SALAH satu bahan dasar jamu Indonesia, temulawak, tanpa disadari ternyata hak patennya telah dipegang pemerintah Amerika Serikat. Padahal temulawak yang merupakan tanaman obat-obatan ini tergolong dalam suku temu-temuan (Zingiberaceae) sekaligus berasal dari Indonesia, khususnya Pulau Jawa, kemudian menyebar ke beberapa tempat di kawasan Indo-Malaya. Saat ini, sebagian besar budidaya temu lawak berada di Indonesia, Malaysia, Thailand, dan Filipina. Di Jawa, tanaman itu dikenal dengan nama temulawak, di Sunda disebut koneng gede, sedangkan di Madura disebut temu labak. Kandungan utama yang dimiliki temulawak adalah protein, karbohidrat, dan minyak atsiri yang terdiri atas kamfer, glukosida, turmerol, dan kurkumin. Baru-baru ini, kurkumin dinyatakan sebagai zat yang mampu membuat orang panjang usia karena khasiatnya sebagai antiinflamasi (antiradang) dan antihepotoksik (antikeracunan empedu). Di Indonesia, temulawak telah dikenal luas sebagai bahan dalam jamu tradisonal yang memiliki banyak khasiat kesehatan seperti mengatasi gangguan lever, mencegah hepatitis, meningkatkan produksi cairan empedu, membantu pencernaan, mengatasi radang kandung empedu, radang lambung, dan gangguan ginjal. Selain itu, temulawak juga bisa menurunkan kadar kolesterol tinggi, anemia/kurang darah, melancarkan peredaran darah, gumpalan darah, malaria, demam, campak, pegal linu, rematik, sakit pinggang, peluruh haid, keputihan, sembelit, ambeien, menambah nafsu makan, batuk, asma, radang tenggorokan, radang saluran nafas, radang kulit, eksim, jerawat, meningkatkan stamina, radang kandung empedu dan batu empedu. Selain dimanfaatkan sebagai jamu dan obat, temulawak juga dimanfaatkan sebagai sumber karbohidrat dengan mengambil patinya kemudian diolah menjadi bubur makanan untuk bayi dan orang-orang yang mengalami gangguan pencernaan. Di sisi lain, temu lawak juga mengandung senyawa beracun yang dapat mengusir nyamuk karena tumbuhan tersebut menghasilkan minyak atsiri yang mengandung linelool, geraniol yaitu golongan fenol yang mempunyai daya repellan nyamuk Aedes aegypti. REPUBLIKA.CO.ID, LONDON--Sebuah mawar dengan nama apapun, akan tetap indah, demikian Shakespeare mengkiaskan. Keindahan mawar kerap menjadi simbol asmara dan cinta. Tapi tahukah Anda, mawar juga penuh khasiat pengobatan? Mawar telah ditanam untuk tanaman taman dan bunga potong untuk dekorasi dan sumber wewangian alami dan perasa. Sekarang ada tidak kurang dari 7.500 varietas mawar di seluruh dunia. Tidak hanya mempercantik rumah dan taman, sejarah juga menunjukkan mawar telah digunakan dalam pengobatan, makanan, parfum, dan kesehatan. Mawar memiliki minyak esensial untuk parfum sehingga banyak digunakan dalam kosmetik. Kemudian aroma mawar dapat dibuat menjadi beberapa turunan, dari air mawar hingga minyak mawar. Mengetahui ada banyak menggunakan mawar, peneliti Roziana dan Dalina bekerja untuk menemukan penggunaan mawar untuk kesehatan, dengan berusaha untuk menemukan agen antibakteri di dalamnya. Mereka melakukannya dengan mengektrasi mawar segar. Dipengaruhi oleh bagaimana nenek moyang kita menggunakan berbagai macam tanaman untuk menyembuhkan penyakit, Roziana dan Dalina menemukan bahwa ekstrak botani telah lama digunakan untuk mengobati penyakit. Tanaman yang dikenal memiliki sumber yang kaya senyawa yang berharga dan telah menjadi sumber utama dari perawatan kesehatan primer di banyak negara berkembang. Senyawa ini digunakan sebagai prinsip aktif dari banyak obat. Pemutaran tanaman seperti aktivitas antimikroba ekstrak untuk selalu menjadi yang menarik bagi para ilmuwan untuk mencari sumber baru untuk tambahan makanan, kosmetika dan obat-obatan. Demikian juga, Roziana dan Dalina melihat bahwa mawar memiliki potensi terhadap kegiatan mikroba. Mereka berusaha untuk membuktikan bahwa penggunaan ethnobotanical kelopak mawar dapat menjadi obat diare dan tonsil membesar, umumnya disebabkan oleh E coli. Dalam percobaan mereka, proses ekstraksi dengan menggunakan beberapa pelarut dilakukan, pengujian aktivitas antibakteri ekstrak pada Escherichia coli - bakteri gram negatif, melalui metode difusi cakram Kirby-Bauer. Jaringan kelopak bunga mungkin memiliki aktivitas antibakteri sebagai sistem perlindungan alami untuk reproduksi dan pelestarian lebih lanjut melalui pembentukan biji. Jadi beberapa varietas mawar telah dipelajari untuk potensi diferensial kegiatan di tingkat genotipik dan ditemukan untuk menjadi aktif terhadap spektrum bakteri gram positif dan gram-negatif dengan perbedaan profil kegiatan. Biasanya, senyawa polaritas yang berbeda diambil dari mawar namun dalam penelitian ini, diekstrak dari residu mawar. Pada ekstrak mawar biasanya mengandung linalool, alkohol phenylethyl, citronelol, nerol dan geraniol. Sementara senyawa utama mawar diekstraksi oleh ekstraksi pelarut yang isopropyl miristat, rhondinol, 1-nonadecene dan heneicosane. Senyawa ini dapat dideteksi dengan kromatografi gas dengan alat spektrometri dan umumnya, mereka memiliki polaritas yang berbeda di mana mereka akan dipisahkan menjadi kelompok-kelompok semacam itu dari polaritas pelarut. Sebagai tujuan dari metode ekstraksi pelarut untuk memisahkan campuran organik menjadi sebuah kelompok yang sama senyawa, secara teoritis, senyawa polar diekstrak memiliki kecenderungan harus dengan pelarut polar. Oleh karena itu senyawa non polar akan lebih dipilih untuk menjadi pelarut non polar. Untuk menemukan nilai-nilai antibakteri, Roziana dan Dalina menggunakan uji difusi Kirby Bauer. Ini adalah untuk menentukan kerentanan atau perlawanan dari patogen bakteri aerobik dan fakultatif anaerob untuk berbagai senyawa antimikroba. Kabar baiknya, Roziana dan Dalina menemukan bahwa mawar segar yang diekstrak dari etil asetat menunjukkan hasil yang paling menjanjikan dari keempat ekstrak lainnya. Ini menunjukkan 39 mm zona hambatan pada agar Mueller Hinton, zona diameter terbesar dibandingkan dengan ekstrak lain, menunjukkan bahwa bakteri Gram-negatif dari E coli yang sangat rentan terhadap ekstrak. Ini berarti naik ekstrak potensial untuk membunuh atau menghambat pertumbuhan E coli. Mereka menyimpulkan bahwa senyawa polar antara dalam mawar baik segar atau residu, mereka memberikan potensi besar sebagai agen antibakteri untuk menghambat E coli. Efforts to combat resistance to antibiotics will fail unless developing countries are included in the battle, a conference heard last week. Problems that beset poor countries, such as the cost of future antibiotics and their availability, must be tackled in any attempt to find long-term answers to resistance, delegates from 45 countries agreed at the meeting, held at Uppsala University, Sweden, (6–8 September) and organised by Action on Antibiotic Resistance (ReAct). They also agreed that global cooperation is urgently needed to slow the spread of resistance by limiting the use of antibiotics — and also to monitor its growth, given that common infections might once again become fatal as bacteria become resistant to current treatments. Andreas Heddini, executive director of ReAct and a medical doctor at the Karolinska Institute, Sweden, said there had been a "change of tone" at the meeting. Drug industry representatives acknowledged for the first time that there was a need to tackle issues in developing countries, he said. An important step could be restricting the use of the latest or broadest antibiotics in developing countries for conditions that have alternative treatments, said Heddini. But, to do so, scientists need more community-wide data so they can understand the spread of resistance and, therefore, which drugs need to be prioritised or restricted in which places. "So far, only hospital data is available from developing countries," Heddini said, which gives only a partial picture. Eva Ombaka, former president of the not-for-profit Ecumenical Pharmaceutical Network (EPN), said that scientists in developing countries "can help provide a good indication of what is really happening on the ground" and that mapping the spread of antibiotic resistance around the world needs their input. Delegates discussed the need for new models of private–public cooperation to work towards new classes of antibiotics that do not rely on investment by pharmaceutical companies in search of high-profit, branded drugs. To this end, Heddini said a number of working groups have been set up that will meet over the next two years. The efforts will emulate existing partnerships in malaria and tuberculosis drug innovation, including the Open Source Drug Discovery programme, which might cut research and development costs while still delivering new drugs. Earlier this year the Transatlantic Task Force on Antimicrobial Resistance (TATFAR), set up by the European Union and the United States in November 2009, published its terms of reference on investigating antibiotic resistance issues. It was criticised by ReAct and others for not including developing countries in its remit. But Stuart Levy, director of the Alliance for the Prudent Use of Antibiotics, told SciDev.Net: "That the United States and Europe have come to the table on this issue is an important first step. Finally, the urgency has been recognised, which might lead to more funding for seeking solutions. "I don't want this to fail because of political issues." The Southeast Asian Regional Center for Graduate Study and Research Agriculture (SEARCA), the National Academy of Science and Technology, Philippines (NAST), and the Dioscoro L. Umali Foundation (DLUF) is now inviting for nominations for The Dioscoro L. Umali Achievement Award in Agricultural Development. This award honors exemplary Southeast Asia (SEA) nationals whose work has provided significant positive impact on the development of agriculture and the improvement of the quality of life in rural communities in the region. Please follow the link below for the award details. We are looking for a candidate motivated by systems biology and with strong background in mathematical modelling and computer science. Previous training in biology is an advantage. To apply, please send an e-mail to ovidiu.radulescu@univ-montp2.fr with a CV and the names of 3 referees before June 30. Studying lipid metabolism of Plasmodium is of great interest as its normal functioning is essential for the survival of the parasite. Targeting this metabolism with drugs represents a new pharmaceutical approach against malaria. Plasmodium is well suited for systems biology studies because during its life cycle this parasite activates a rare diversity of metabolic pathways. Reconstructing synthesis pathways of lipid metabolism in Plasmodium is crucial for understanding the biology of this agent of disease. The objective of this thesis is to develop a methodology for constructing dynamic mixed metabolic and genetic networks by using heterogeneous data. This methodology will be applied to transcriptomic and metabolomic data in order to build a model for lipid metabolism in Plasmodium. This model will be used for /in silico/ studies of the life cycle and of the defences against perturbations of the parasite. The phD Student will join the new team `Biological Physics and Systems Biology` in the lab DIMNP (UMR 5235) in Montpellier. Our team develops physical, mathematical and computer science approaches for the understanding of the functioning of biological systems. At the centre of our approaches is the multi-scale modelling of the biological processes by using statistical physics, dynamical systems and stochastic processes techniques. * Genomics and Crop Science (Plant Biotechnology; Plant Genetics; Plant Physiology; Plant Genomics; Crop Sciences; Advanced technologies in Horticulture; Crop production and quality). * Agriculture, Environment and Landscape (agroecology, organic, integrated or low-input agriculture, functional biodiversity in agroecosystems, landscape agronomy, multicriteria analysis of food and non food cropping systems, agri-environmental analysis of agricultural systems, multifunctional agriculture, agriculture-territory-landscape interactions). * the School reserves the possibility of accepting a maximum 2 additional students without a grant or other forms of financial support. * Candidates are requested to apply online at www.sssup.it/phdapplicationonline by October 29, 2010, 12.00 am GMT. In case of problems with the online application, please contact the PhD Administration Office (tel. +39.050 883.220/3836, e-mail: infophd@sssup.it). An international consortium aiming to re-engineer rice to increase yields by 50 per cent is about to move into the second phase of its decades-long project. The project aims to genetically modify rice to use a more efficient method of photosynthesis - the process by which plants convert carbon dioxide into carbohydrates needed for growth. Rice has a type of photosynthesis called C3. But some plants, including maize and sorghum, have evolved to use a type called C4. The C4 crops are anatomically different from C3s and are better at concentrating carbon dioxide around a particular enzyme - RuBisCO - which is crucial in photosynthesis. If the scientists are successful in creating rice that follows the C4 pathway the crop could produce 50 per cent more grain, and would require less water and fertiliser. The C4 plants work best in hot climates, so could be important as global warming increases. "As temperatures rise, C4 plants will photosynthesise better than C3s," said Richard Leegood, a plant biologist from the UK-based University of Sheffield, which is leading an international team of researchers, coordinated by the International Rice Research Institute (IRRI) in the Philippines. The project received US$11.1 million of funding over three years from the Bill and Melinda Gates Foundation in October 2008. Most of this money has gone to IRRI, said Leegood, where researchers are doing the mammoth task of screening plants to try to identify the genes that control photosynthesis. The project is a long-term venture - Leegood says that it will be at least 20 years before the modified rice is available. "Many genes need to be manipulated, then engineered traits need to be transferred into commercial varieties." Since C3 photosynthesis evolved naturally into the C4 type in other plants more than 60 times through history, Leegood hopes that the public will accept this GM rice. "It is not an unnatural process; it's something that plants do ordinarily." Lewis Ziska, a plant physiologist at the US Department of Agriculture said: "This kind of innovative work is crucial if we are going to meet the demands of an expanding population".. Although there are many other issues that cause food insecurity, Leegood said that this solution could tackle those limitations that are "inherent" in the production of such crops. The Sheffield work forms part of its Project Sunshine, a programme that investigates how the power of the sun can be harnessed to meet the world's increasing food and energy needs. Silase adalah hijauan makanan ternak (HMT) yang diawetkan dengan teknologi fermentasi. Pembuatan silase bertujuan untuk mengatasi masalah kesulitan penyediaan hijauan makanan ternak pada musim kemarau. 1.Persediaan makanan ternak pada musim kemarau. 3.Mendayagunakan hasil ikutan dari limbah pertanian dan perkebunan. Salah satu solusi untuk meningkatkan dan menjaga produktivitas ternak dengan memaksimumkan pasokan nutrien kepada ternak yang optimal sesuai dengan genetiknya, dengan menambahkan bahan pakan aditif berupa PROBIOTIK, vitamin, mineral makro dan MINERAL MIKRO untuk dapat meningkatkan produktivitas dan kualitas serta menjaga kesehatan ternak dari infeksi saluran pencernaan. Perkembangan peternakan di Indonesia khususnya peternakan sapi dari tahun-ketahun masih belum menggembirakan. Produksi daging, susu, dan bakalan sampai saat ini belum dapat memenuhi permintaan kebutuhan untuk beberapa daerah. Hal ini berdampak pada tingginya nilai impor bakalan untuk penggemukan 141,7 ribu ekor, impor susu 107,86 ribu ton untuk konsumsi, impor daging 42,02 ribu ton dan impor induk untuk bibit 6,5 ribu ekor (BPS, 2003). Salah satu upaya untuk menurunkan angka impor dan menuju swasembada daging dan susu diperlukan peningkatan produktivitas dan kualitas ternak. Dampak dari tercapainya swasembada daging dan susu akan meningkatkan taraf kesejahteraan dan kesehatan penduduk. Peningkatan produktivitas ternak merupakan fungsi dari ketersediaan pakan dan kualitasnya secara kontinu sepanjang tahun. Terganggunya ketersedian pakan ternak tidak akan meningkatkan pertambahan bobot badan, penurunan kualitas produksi susu segar bahkan sampai menurunkan bobot badan harian. Penurunan kualiats produksi sangat berpengaruh pada keuntungan, sebab biaya produksi tetap harus dikeluarkan oleh peternak, sehingga peternak dengan perlahan akan mengalami kerugian. Probiotik merupakan pakan aditif berupa mikroba hidup yang dapat meningkatkan keseimbangan dan fungsi pencernaan hewan inang, memanipulasi mikroflora saluran pencernaan untuk tujuan peningkatan kondisi kesehatan serta meningkatkan produktivitas ternak. Bahan pakan aditif lainnya adalah MINERAL ORGANIK yang mempunyai ketersediaan biologis lebih baik dan toksisitas lebih rendah dibanding dengan mineral anorganik. Salah satu mineral yang dibutuhkan adalah kromium (Cr), Zinc (Zn), dan Selenium (Se) harus ditambah lagi mineral lainnya yang berperan dalam masuknya glukosa ke dalam sel. Pada sapi perah, Cr akan meningkatkan masuknya glukosa ke dalam sel kelenjar ambing sehingga akan meningkatkan kadar laktosa dan meningkatkan produksi susu. Pada sapi pedaging dan pedet, peningkatan glukosa ke dalam sel akan memberikan energi tambahan bagi metabolisme tubuh, sehingga pertumbuhan menjadi lebih baik dan menurunkan persentase lemak karkas. 4. memberikan pengaruh yang menguntungkan ternak : laju pertumbuhan, meningkatkan efesiensi pakan, meningkatkan produksi dan kesehatan ternak. D. Pelatihan (pembuatan nata de coco, pupuk bio, perawatan anggrek dan tanaman hias, penggemukan sapi, kultur jaringan tananaman) permintaan pelatihan minimal 10 peserta. We primary seek candidates with a Master in Materials Science or Solid State Physics, motivated for experimental activities in the fields of aluminum alloys according to a BILAT project between Norway and Japan. The purpose of the bilateral project, called `Norwegian-Japanese Al-Mg-Si Alloy Precipitation Project`, is as follows: `The primary objective is to identify impact of selected trace elements on precipitation and study vacancies in relation to trace elements in Al-Mg-Si alloys. This will be done in a bilateral Norwegian/Japanese research collaboration between Norway (Norwegian University of Science and Technology (NTNU) / SINTEF / Hydro Aluminum) and Japan (University of Toyama /Tokyo institute of Technology). Building up competence to understand these fundamental issues will be of general importance for the light metals community and can assist Hydro in increasing the quality and reduce the energy consumption in their future Aluminum products`. The PhD project is called `Vacancies in aluminum alloys in a context of trace elements and recycling`. Here experiments and calculations will be used to focus on vacancies, how they bind with solute, their effects on diffusion, nucleation of precipitates, in special relation to the trace elements in 6xxx alloys. In this study we aim at detecting vacancies (indirectly or directly) preferably via solute-vacancy pairs. To study some features of the vacancies various advanced microscopy analytical techniques like scanning TEM (STEM), electron energy loss spectroscopy (EELS) and X-ray diffraction (XRD) may be used. The more recent techniques Positron Annihilation Spectroscopy (PAS) / Positron Annihilation Lifetime Spectroscopy (PALS) are probably most significant, because they are specially suited for the study of vacancies or pores in materials. Here one aim is to find the factors that make it possible to control the strength increase taking place at room temperature just after cooling from extrusion (prior to final ageing). This is believed to be driven solely by vacancies. Studying vacancies is a challenging task. However, with the use of several independent methods, the combination of the two projects, the previous experience in precipitation and precipitate structure for these alloys, and at last, the long industrial research with these materials, it is expected that new insights will be achieved. Experience in transmission electron microscopy (TEM) and other advanced characterization methods is useful. Depending on chosen topics and project needs, and the candidates` background and qualifications, the position will be allocated either to the Materials Science or the Physics department in NTNU. PhD fellowships at NTNU are normally awarded for a total of 3 years with the possibility of until 1 year extension with 25% teaching duties in agreement with the department. The national labour force must reflect the composition of the population to the greatest possible extent. It is therefore a major political objective to achieve a balance of age and gender and to recruit persons with an immigrant background. The start salary for the PhD fellow is set at level 45 in the national salary scheme, gross NOK 355.400 per year, of which 2 % is deducted for the State Pension scheme. The appointment will be made in accordance with current regulations with relevant parts of `Supplementary guidelines for employment as research fellow at NTNU`. Applicants must agree to participate in organized doctoral study programs within the period of the appointment and have to be qualified for the PhD-study. A contract will be drawn up regarding the period of appointment and work-related duties. Publications and any other work which the applicant wishes to be taken into account should also be enclosed. Joint works will be considered. If it is difficult to specify the input of the applicant in a joint work, a short summary should be attached outlining the applicant`s input. Incomplete applications will not be taken into consideration. Applications with CV, certified copies of testimonies and documents and other relevant documents should be submitted electronically through www.jobbnorge.no. Preferably we want the attachments in one file. Ph.D. POSITION, Plant Production Systems in "JARAK: the commoditization of an alternative biofuel crop in Indonesia"
Ph.D. POSITION, Plant Production Systems in "JARAK: the commoditization of an alternative biofuel crop in Indonesia" at the Plant Production Systems Group and Agrosystems Research Department of Plant Research International, part of Wageningen University and Research Centre, the Netherlands in cooperation with the Research Center for Natural Resources and Biotechnology (IPB), Bogor Agricultural University, Indonesia. Growth, development and production of Jatropha curcas in Indonesia. Although heavily promoted for its many advantageous properties, there is little scientifically-sound information available on the growth, development and production of the Jatropha curcas under different environmental circumstances and in different production systems. As it is essentially a wild species lacking clearly distinguished varieties, the use of different jatropha accessions gives a wide variety of growth and development patterns, leading to unpredictable growth and yields, and sometimes unwanted situations. This is caused by the complex interactions between Genotype (G) x Environment (E) x Management (M), which must be unraveled to fully understand the production potentials in order to understand the true value and applicability of jatropha in different production systems. The different environmental and socio-economic settings determine the (design of) optimal production systems for jatropha, and govern the efficiency of resource use (radiation, water, soil fertility). The aims of this PhD research are the acquirement of those plant parameters that describe growth and development patterns of jatropha production systems in Indonesia and to optimize seed yield per unit of land and/or unit of labour in specific production systems. Starting date: ASAP after recruitment latest 1st August 2010. This is a PhD position in the program "JARAK: the commoditization of an alternative biofuel crop in Indonesia". The program comprises research on policy, legislation, technical crop qualities and production possibilities, and socio-economic impact of Jatropha cultivation in Indonesia and is part of a broader research program funded by NWO and KNAW on “Agriculture beyond Food”. The program includes 6 projects carried out by four PhD researchers and two Post-Doc researchers from Indonesia and the Netherlands. JARAK is an interdisciplinary research program of 5 Dutch academic institutes with their Indonesian partner institutes. Three other PhD researchers in the JARAK program are based at Leiden University (Van Vollenhoven Institute, Law Faculty, and the Institute of Cultural Anthropology , Social Science Faculty) and at Universitas Gadjah Mada in Yogyakarta. • To participate in the C.T. de Wit Graduate school in Wageningen. • Willingness to stay in the Netherlands for desk study and writing. • Full time availability for four years because the thesis should be finished and defended at the end of the cluster period December 2014. The successful applicant will be awarded a research fellowship under NUFFIC conditions for 4 years, with continuation dependent upon an evaluation after 12 months The fellowship consists of a 6 month period in Wageningen at the start of the project, followed by an extended period of field work and a final period to write papers and submit the thesis in Wageningen. Details of the stipend and terms of the fellowship can be obtained on demand. Applicants should submit an application by April 20th 2010. Applications should be sent to jarakphd3@gmail.com addressed to Dr Maja Slingerland and Dr Sony Suharsono with the subject: “Application JARAK PhD position Indonesia”. Three selected candidates will be invited for interviews in April 2010. Final selection first week of May. Starting in the Netherlands: August 1st 2010. • a short research proposal of up to three pages, including a letter of motivation. More information on the the JARAK program can be obtained from Dr. Jacqueline Vel: J.A.C.Vel@law.leidenuniv.nl . More information about this specific PhD project can be obtained by maja.slingerland@xs4all.nl or sony.suharsono@yahoo.com . IELTS: 6.5 , with a minimum of 6.0 for each (academic) module. Submitted test results must be dated within 24 months prior to an application to the PhD Programme. BackgroundThe financial, food, fuel and climate crises are individually serious issues, but in combination their impact could be catastrophic for the global economy. Perhaps we stand at a crossroads. Even as we move into a global economic downturn there are growing calls for an accelerated transformation towards low carbon and resource productive economies. To move forward will require new and more efficient solutions, technologies and products alongside behavioural change. Climate change is now universally recognised as a significant global environmental challenge and as a consequence, debate over the measures needed to tackle climate change has moved up to the top of the agenda amongst civil society, business and government. The United Nations Climate Change Conference in Copenhagen in December 2009 highlighted the major challenges and opportunities associated with climate change as we move towards post 2012 carbon dioxide (CO2) reduction targets. In October 2008, the UK raised the bar by announcing a target of cutting CO2 emissions by 80% by 2050. Innovation will be a core part of the way forward. The Stern Review underlined that increased investment in R&D and innovation could significantly reduce CO2 emissions and we have seen more than $5 billion of venture capital invested in clean tech worldwide since January 2007 (Source: Ernst & Young).. However, we need to create much better international, national and regional structures and systems to adapt to climate change as well those to stimulate, nurture and progress new low carbon ideas through R&D to commercialisation and the marketplace. A new system is needed that fosters sustainable, low carbon and resource productive innovation - short, medium and long-term. Designers, innovators, investors, entrepreneurs, consumers and governments all have a role to play in the change that is needed. WGGW Conference & Expo 10 themed “Impacts of the Global Recession on Sustainable Development, Climate Change Policy and Markets'' will provide a platform to discuss the future opportunities and challenges related to the design, development and commercialisation of low carbon innovation, technologies, products and services.WGGW Conference & Expo 10 will include invited and refereed papers from academics, consultants, entrepreneurs, investors, technology providers, designers, sustainability, environment and Corporate Social Responsibility (CSR) managers as well as other business functions. The event will be a unique learning experience, networking space and an opportunity to think. Delegates will come globally from companies, entrepreneurs, as well as academia, government and non-governmental organisations (NGOs). The conference is supported by an international Advisory Board. Conference papers: please email to don_jack@o2.co.uk , fax or email up to 500 words describing your proposed paper by deadline 7th May, 2010. The paper will then be sent to the Advisory Board for evaluation and authors will be given feedback on or before 14th May, 2010 the deadline for paper acceptance. Please only submit abstracts if you have registered for the conference. Registration is free of charge. The aim in this project is to develop an innovative biophysical approach based on the use of magnetic nanoparticles (MNPs) that will allow us to exert forces on, and actively manipulate, individual receptor proteins on the surface of living cells using smart external magnetic fields. It is anticipated that active manipulation of these receptor proteins will provide a very powerful tool that will give new insights into biophysical processes in cells. Exploring the physics of this new technology is the primary objective. To demonstrate the power of this biophysical method, it will be applied to address key issues in cell signaling. By controlling the aggregation of membrane-associated receptor molecules, the state of immune system T cells can be actively switched from an `inactive` to an `active state`, thereby mimicking a process that is crucial in cell signaling. The work will be carried out in the Biophysical Engineering Group, which has a long-standing experience in developing physical tools to study biology on the molecular and cellular scale. The group has a well equipped laboratory with a wide variety of both home-build and commercial setups such as AFM, optical tweezers, magnetic tweezers, FLIM, TIRF and CLSM. The current project builds on the vast experience of the group in the application of magnetic tweezers to cell biophysics (see e.g. a.h.b.deVries et al., 2007, Nano Letters 7:1424-1427). You can expect to be part of a team of enthusiastic and inspiring colleagues. The research group is part of the MIRA Institute for Biomedical Technology and Technical Medicine and the MESA+ Institute for Nanotechnology, and participates in the new Twente Graduate School. For the application of the method on living cells we will collaborate with prof. C.G. Figdor from the NCMLS at the Radboud University of Nijmegen. You will design and fabricate a magnetic tweezers setup to generate appropriate external magnetic fields and integrate this with a state-of-the-art fluorescence microscope. You will perform Brownian dynamics simulations and develop an experimental model system based on artificial membranes in order to characterize the physical aspects of protein manipulation using MNPs. You will assess various techniques (optical and non-optical) to visualize the magnetically induced changes in protein/MNP distributions. Finally you will apply the method to study receptor aggregation dynamics in T-cells. We are looking for an experimentalist with a background in experimental (bio-) physics, who is interested to work in the new and rapidly developing field of nanobiophysics. You will have an employee status and can participate in all the employee benefits FOM offers. You will get a contract for 4 years. Your salary will be up to a maximum of 2,610 euro gross per month. General information about working at FOM can be found in the English part of this website under Personnel. The `FOM-sollicitatiecode` (in Dutch) applies to this position. For more information please contact Hans Kanger tel. : +31 (0)53 489 37 26, or Prof. Vinod Subramaniam. Incomplete or mass-mailed applications will not be considered. Applications should include a resume, list of grades, and a one-page motivation. Details on the DISI Department and on the PhD School as well as a link to the online application are provided at the bottom of this information. The Department of Information Engineering and Computer Science is one of the leading and faster-growing research institutions, characterized by a young and international faculty and by a large, international student population. Indicators for scientific production put the department among the very top in Europe. The successful candidate will therefore have the opportunity to work in a dynamic and exciting environment. Trento is a vibrant city with a beautifully preserved historic center, consistently ranked at the top for quality of life in Italy. It offers a variety of cultural and sports opportunities all year around, as well as excellent food and wine. Indonesian Danone Institute Foundation was incorporated in May 2007 a an independent, non-profit organization, separated from the Danone business units. The Foundation is supported by eight Scientifice Members from various institutions in Indonesia. Promote the advancement and sharing of knowledge in the areas of diet, nutrition and health, focusing to address current and prevent future major local nutritional and health issues such as double-burden nutrition problems (under nutrition and over nutrition) of low-income Indonesian populations (Social Economic Class CDE). Promote scientific research findings fieldworks recognized by local and international scientific communities in the related disciplines to the above mission, especially those leading to the creation of the low-cost food and safe water solutions to address the major local nutritional and health issues. 1. A link between scientists, and nutrition, health & education professionals, who bring relevant scientific knowledge to the attention of the public. 2. A clearing house for information on nutrition and diet-related subjects. - To promote quality scientfic research of Indonesian scientists and bring stronger credibility of these findings & discoveries through the appearance in relevant international journals. 1. Competitive research Grant for Doctorate students through educational institutions. 2. Publication grant for publishing Indonesian research papers in international journals. 3. Competitive Research Grant for established research Institutions (educational institutions - universities, colleges, - reputable NGOs, and other research-related institutions). - Innovation in the development of nutritionally balance and affordable complementary feeding for children 6-24 months. - New effective strategies in communication, education and information (KIE) to reinforce the role of breastfeeding, especially exclusive breastfeeding. 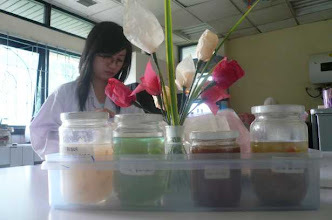 - Development of local food products to fulfill nutritional needs of women. Dalam workshop ini akan diajarkan mengenai penggunaan sistem ekspresi Bacillus dalam rekayasa genetika. Dalam workshop ini akan diajarkan mengenai teknik purifikasi protein. CIEB 2010 akan berisi presentasi oral/kuliah dari pembicara undangan dan presentasi poster dari peserta. Peserta yang ingin mempresentasikan posternya, harus mengirimkan abstrak kepada panitia melalui email paling lambat 15 Juni 2010. Abstrak sepanjang 200-250 kata harus dalam bahasa Inggris dan diketik dengan MS Word atau OpenOffice Writer. Dalam abstrak, peserta harus menuliskan nama dan institusi penulis, alamat email dan keywords. Penulis yang abstrak-nya diterima akan diberitahu melalui email paling lambat 1 Juli 2010. Untuk informasi lebih lanjut silakan mengunjungi situs web kami atau menghubungi panitia penyelenggara. On behalf of the Indonesian Biotechnology Consortium (KBI) we wish to extend our invitations to all KBI Members and other colleagues to participate in the International Biotechnology Seminar & 5th KBI Congress, to be held at University of Muhammadiyah Malang, East Java, Indonesia, during July 27-30, 2010. The success of our Seminar & 5th KBI Congress depends upon your participation. We hope you will make a special effort to attend. We are looking forward to seeing you at the Seminar & 5th KBI Congress. The International Biotechnology Seminar & 5th KBI Congress, to be held at University of Muhammadiyah Malang, East Java, Indonesia, during July 27-30, 2010. Malang is the second largest city in East Java province, Indonesia. The average climate of Malang is around 22-25 0C in dry season and rainy season. Malang is located on the hilly land at the height of 450 - 467 meters above the sea level, in the position of 7 59” tp 112 18 “. It is surrounded by five mountains Arjuno, Panderman, Banyak, Bromo, Semeru, Anjasmoro, Welirang, Kawi and Kelud. Malang has a reputation as being a nostalgic city of Holland, a city of People Party Festival which is held every year, as well as an annual and three or four monthly schedule of cultural, music, Food Festival, handicraft festival, book fair, and national and international seminars. The city is famous for its cool air and people in East Java sometimes call it "Paris van East Java." The poor have a culture of words that is different from others that the current language has evolved from community-owned jargon known Malang Walikan language (reversed). You will also have the chance to enjoy the atmosphere of Malang as an old city with the Holland’s architectural building, a city with national events of sport and music, and a traditional East Java city which has the dynamic and energetic culture. The city’s layout regarded as being among the best in Indonesia makes it easy to to get around by foot, bicycle, motor cycle, or public transportation. It is also easy to get directly by plane or train from Jakarta the capital city of Indonesia and also from other cities in Indonesia. Malang has many kinds of trees and flowers which function to decrease pollution. Malang is known with its beautiful beaches. The beaches are Ngliyep, Balekambang, and Sendang Biru beach. Then the foreign tourists are commonly interesting to Malang's temples that save the historical value of the past Kingdom, they are; Singosari temple, Jago temple, Kidal temple, etc. Beside that, Malang still has a lot of tourism objects that will attract you to visit it. Coban Rondo waterfall, Wonosari tea plantation, Wendit pool, mount Kawi, mount Bromo panorama, Coban Pelangi waterfall, Karangkates recreation park, and the others, are Malang's interesting places that presents their nature scenery. The City square is a beautiful park circled by old buildings like Masjid Jami, Chatolic Churh and few shopping centers. Jalan ijen is greenbelt area beautified by Bougainville flowers and Palm Trees. The background is housing with Holland-Colonial Architecture. Brawijaya Museum is military museum which keeps the traditional and modern guns ever been used in the independence fighting era. Ceramic is a special souvenir from Malang, the Ceramic Industry Centers is located at Jl. MT. Haryono, and Mayjend Panjaitan. This is a special place with special product of ceramics from Malang. The visitors can show the process of the ceramics creating on the factory. In arjosari, there is a place for making and selling rattan handicraft of Malang City. This place is 5 km from the city square. Malang is the center of food of East Java and is the destination of domestic tourists and international tourists who want to enjoy special food of Malang and Indonesia like Bakso Malang, tempe chips and variety of fruit chips. There are many traditional and modern restaurants, and also food centers. Shopping is easy with many traditional markets, vegetable and daily needs vendors and supermarkets. English will be the official language of the seminar. Indonesian Visa is not required for several countries. For citizens of countries without diplomatic relations with Indonesia, we strongly suggest that you contact the travel company making your travel arrangement or your nearest Indonesian Embassy. Upon request, the Secretariat will send a personal Invitation to participate in the seminar. It should be understood that this invitation is only to help participants to raise travel funds or to obtain Visa. IT DOES NOT IMPLY A COMMITMENT on the part of the Organizing Committee to provide financial support. The climate in Malang is tropical. The recommended dress for the seminar session and social functions is casual to smart casual. Major International credit cards (Visa and Master card) are widely accepted in the major hotels, restaurants, and shops in the major cities in Indonesia. ATM Machine are available in major cities of Indonesia, but they are not widely spread in all cities. So, it is recommended to bring some cash (US Dollar) with you. The Organizer has made arrangement on hotel accommodation for seminar Participants ranging from a 3 to 5 star and budget hotels. Special hotel rates have been negotiated with Official Hotel for participants. All hotels are located within city of Malang.